Around 2.3 million tonnes of food are being thrown away every year in Switzerland. That's about 300 kg per person. In the best case this food waste is converted into energy and heat in biogas plants. In the worst case, the food waste is collected, transported and disposed in municipal solid waste incineration plants. According to the Swiss Farmers' Association, around 800,000 tonnes of high protein feeds were imported in 2014, which is more than 50% of the complete demand. However, the import rate for other feeds is only 10-20% depending on the feed type. Hence, Switzerland is importing a lot of high protein feeds. Most high protein feed is originating from plants like soy beans and is nearly fully imported. Fish meal and oil is imported as well. The high import quota is affecting the feed sovereignty of Switzerland. Fish meal and fish oil are mainly obtained by large-scale industrial fishing practices. The demand for fish meal is growing rapidly as the number of aquacultures and livestock grows steadily to keep up with the consumption of a growing world population. The increasing need for fish meal is one of the drivers for the progressive overfishing of fish species that are processed into fish meal. Most fish meal is produced in Chile and Peru which are countries having differences in laws ruling fish capturing compard to Switzerland. At Ressect, we want to address food waste, high quantity imports of protein feed and overfishing of the oceans by providing a sustainable insect-based feed. Ressect uses food waste for local insect production. These insects are processed into protein-rich feed replacing fish meal and can then be used in various applications. As our products are manufactured in Switzerland long transport distances through imports can be avoided. Further, we re-use precious resources and therefore contribute to a positive ecological footprint. Ressect ENTOGRAN provides all the ingredients representing a complete diet for ornamental fishs that do not feed purely on plants. 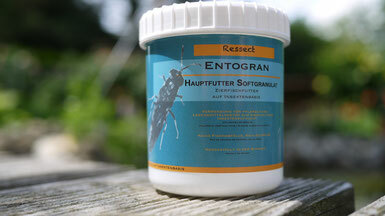 ENTOGRAN consists mostly of insects and other natural ingredients. KOMPOSECT is high quality fertilizer that improves soil fertility and soil structure. To protect against dehydration, waterlogging and invigoration of the microsystem, KOMPOSECT promotes the enrichment of the soil by main nutrients and micro nutrients. Ressect was founded in 2017. 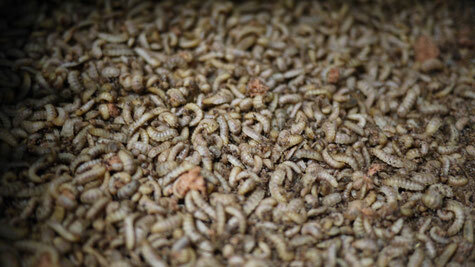 We are a start-up company focusing on the production of feed made out of insects. We use vegetables and plant waste and breed insect larvae, which are then processed into animal feed. In addition, we produce compost and fertilizer. Currently we produce close to Zurich and serve customers throughout Switzerland with our insect-based products. 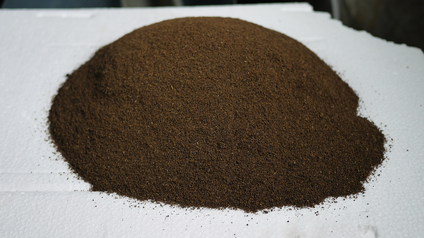 Every month we process several tons of food waste and replace fishmeal in various animal feeds.